A man has been arrested on suspicion of drink driving after a car was found on its side this morning. Buses had to be diverted following the incident in Station Road, Hebburn, just after 7am today, with a section of the road blocked for about two hours. Emergency crews attended the scene but nobody is believed to have suffered any serious injuries. A 53-year-old man has been arrested on suspicion of driving when above the legal limit for alcohol and he remains in police custody at this time. A Northumbria Police spokeswoman said: “At 7.07am today police received a report of a road traffic collision involving one car on Station Road in Hebburn. “Emergency services attended the scene where the car was found on its side. "Nobody was believed to have suffered any serious injuries. “A 53-year-old man was arrested on suspicion of driving a motor vehicle when alcohol above the limit. "He remains in police custody at this time. A number of bus services had to be re-directed following the incident. 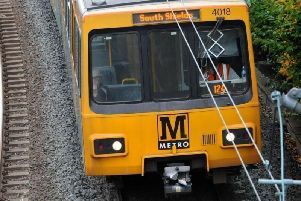 Transport firm Go North East tweeted: "Due to an accident, there is no service at Hebburn Station Rd (ASDA). "Services 26 & 27 are diverting via Campbell Park Rd (Wordsworth Avenue), and are omitting Station R & Victoria Rd East.